Parking can become a major hurdle when filming on location, especially with large crews and limited spaces. In this article, we’ll cover best practices for securing off-site crew parking, organizing shuttles, and designing maps for call sheets. Expect location shooting delays when talent & crew have to scour streets for parking. Even if you reimburse upon arrival, your talent or crew may not have acceptable forms of payment on hand further causing delays getting to set. If you are in a residential area, the impact of 25-100 cars is significant. It can not only negatively effect your ability to shoot there again (if it’s a multi-day location), but you may need to deal with officers who are called in. If you won’t be reimbursing for parking, expect some of your cast or crew will attempt to find street parking. This opens the possibility of being ticketed or having vehicles towed. If you’re filming on location in a seedy part of town, the likelihood of theft is higher, especially when cars remain unmoved for a 12+ hours. Parking lots with on-site security offer peace of mind. If you buy spots in bulk, you can often secure a parking lot or garage at less than the usual rate per car. Crew will not need in and out privileges which keeps costs down. In cities like Los Angeles and New York it’s not legal to park a large crew in neighborhoods. Remember to check local city and county laws. Production insurance polices usually cover vehicle theft that occurs in secured or guarded lots. Street parked vehicles may not be covered (with the exception of working vehicles). You may be able to use the parking lot as basecamp or a dedicated location to serve meals - just make sure safety is a priority. Want to avoid parking payment delays or dealing with reimbursements altogether? Dispatch a production assistant (PA) to wait by the entrance of the lot with cash on hand to pay for your talent & crew as they pull in. Ask the PA to mark them off the call sheet to serve as a record of money spent. It might go unsaid, but when filming on location, parking needs to be as close as possible to set. Follow a five minute rule whether by walking or shuttling to set. You can search for crew parking locations using Google Maps. Although, nothing beats driving the surrounding area. Paid parking lot – open lots, multi-level garages, city lots. Private Lot – gyms, malls and grocery stores. Business lot – especially if off peak hours. Outdoor Park – if not a weekend. Church – if not a major worship day. School – If not during school hours. If you are shooting on location in an area where filming is common, there are websites and vendors that could help you find crew parking. Here are a few based in Los Angeles. Crew Parking is a free site for searching lots. Alpha Locations offers a free Site Crew Parking Search, and Park as Directed provides a Crew Parking Assistant upon purchase of a parking map. Without a well-thought-out transportation plan, you could be risking delays as cast and crew wait for their shuttle. Add extra padding in the shooting schedule for everyone to arrive on set. Consider this when assigning your cast & crew call times. Account for increased shuttle delays during peak traffic hours. Determine the number of vans and drivers you need. Consider the capacity of each van, the amount of crew you will be moving at any one time, and the average round-trip time per shuttle. Designate dedicated drivers. While you might think there will be downtime for this task, don’t count on it. Identify this person as the Shuttle Driver on the call sheet and circulate the driver’s cellphone on all communications. If you have multiple van drivers you may want to have another person manage the vans and pickups. In this event, only circulate the shuttle manager’s information. That way they can make decisions about who to prioritize transporting based on the shoot schedule. Make sure vans are filled with gas, and drivers have petty cash to refill as needed. Request drivers bring their phone car chargers and earbuds. Most walkies stop working before you cross the 1 mile mark, so you will lose contact with the driver periodically. When preparing your call sheet, make sure you’re as clear as possible when providing parking instructions. If your crew will be parking away from set, make sure you explain where they can unload their gear. Provide clickable maplinks in the email and call sheet. StudioBinder's call sheet builder automatically adds maplinks for set locations, parking and hospitals to easily pull navigation on smartphones (image above). It’s always a good idea to attach a custom maps to accompany the call sheet. Include all relevant details for the shoot day in an easy-to-read, visually pleasing presentation. Parking locations and instructions tend to vary per department, and sometimes per person. For example, extras may park in a separate parking lot than the cast, or some crew members need special parking instructions for unloading gear. How about when executives and high-profile talent require special VIP parking? Accounting for all of these variables in one, generic call sheet document can lead to bloat and confusion. Does your talent really need to know where the generator is parking? No, they don’t. StudioBinder tidies up this process by sending personalized call sheets. In effect, you can provide tailored parking instructions through the private notes functionality with StudioBinder's call sheet feature. 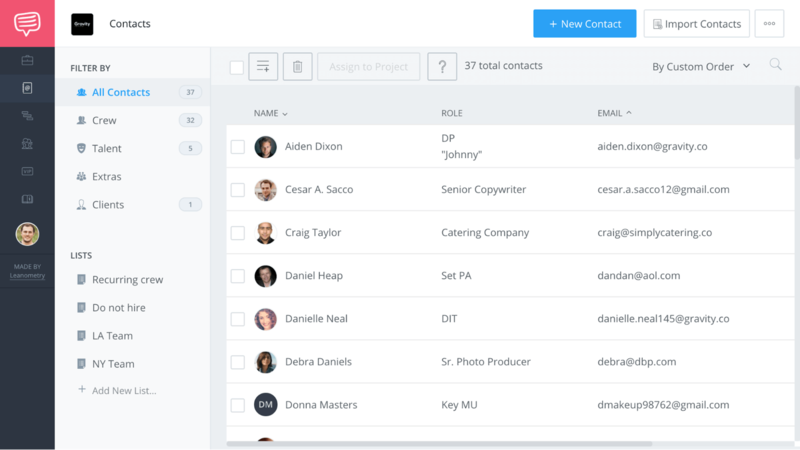 As you can see, choosing contact from within StudioBinder give you complete control over the information that needs to be received by specific crew. Remote filming locations like dirt roads, deserts, trails, mountains, dunes or areas with poor signage and cell phone reception. Universities, colleges or studios may have multiple entrances, parking garages, and long distances to trek before reaching set. Delays can easily result if you do not account for the above. Working trucks & production vehicles usually have unique instructions when filming on location. Display a freeway view leading to the film location. Use arrows to clearly identify locations for parking, set, basecamp and working vehicle parking. Optional. Include a street view photo using Google Maps. Production company and show name. Production contacts for parking, shuttle and production (include mobile numbers). Written directions from major surrounding highways or general direction of travel. We hope that some of these crew parking tips help you avoid parking delays the next time you are filming on location. Did we miss anything? Please leave your feedback or comments below! After that, check out our post on How to Produce a Movie: Pre-Production Process Explained, where we provide a free checklist to keep you on track.